In the spring of 2000, the Rivetti family acquired the 8ha Campè Vineyard, thus fulfilling one of Giorgio’s long-time dreams. The story of the Campè vineyard is quite interesting, and if vines could speak, they would tell you how thankful they are that the Rivetti’s purchased the vineyard. The family took over this south-facing hillside from a producer who never had intentions of making a great wine. In fact, all of the grapes were being sold in bulk to other Barolo producers, and the yields were at the high end of the allowable range for the region. Through a rigorous green harvest, La Spinetta reduced the previous production by 75%, leaving just 25% of the fruit on the vine. The usage of chemicals in the vineyard was prohibited and instead fertilization was carried out utilizing horse manure and extensive manual work throughout the year. Today, the vineyard is full of healthy, strong vines that are over 50 years old and produce exceptionally low yields of extremely high-quality fruit. Campè is a true Cinderella story in Barolo! Technical Info: 50+ year old vines grown in calcareous soils at 265m above sea level. Aged for 24 months in 100% new French oak barrique, then bottled unfined/unfiltered and aged an additional one year at the winery before release. This is a superb set of wines from Giorgio Rivetti. 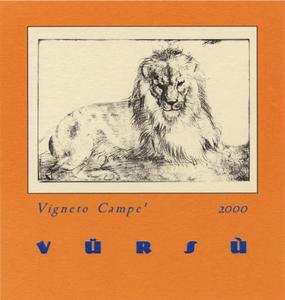 The 2008 Barbareschi are among the strongest wines of the year, while the 2007 Barolo Campe is the best wine to emerge from Rivetti’s vineyards in Grinzane Cavour. The La Spinetta style focusing on wines of great textural richness remains intact, but is dialed in to a greater degree with each passing vintage. There is no doubt the 2007 Barolo Campe is impressive. It is a beautifully balanced wine layered with opulent, super-ripe fruit, new leather and licorice. The French oak is beautifully balanced in this broad-shouldered Barolo, while the fruit avoids the overripe tendencies of the past. The wine holds up perfectly in the glass, which hasn’t always been the case. Tar, licorice and spices wrap around the intense finish. This is the finest vintage of Campe to date. Kudos to Giorgio Rivetti and his team for this fabulous effort. A rangy, feral red, revealing flavors of eucalyptus, medicinal herbs and leather, accented by oak. There's a beam of black currant fruit underneath, and this has stiff tannins on the finish now, so be patient. Deep, youthfully reticent aromas of red fruits and cocoa powder. Richer and deeper than the 2008 but much less expressive today and a bit more angular. Surprising acidity is nicely supported by a strong impression of dry extract. This very rich but classically dry Barolo finishes with outstanding breadth and length but will need at least as long in the cellar as the 2008, which is sexier today.